Bank Asia Job. Assistant Relationship Officer(ARO) Job circular has been publish. The authority of Bank Asia recently posting a job circular in their official website and national daily newspaper. They are requite some Assistant Relationship Officer in different branch. If you are a interested and eligible for this post then apply now. Bank Asia Job Circular 2018. In Bangladesh Bank Asia is one of the leading privet commercial bank in Bangladesh. Recently they are offer a job for the post of Assistant Relationship Officer. It is a contractual job. Candidate must be willing to work in any where in Bangladesh. Application Deadline: 15th June 2016. 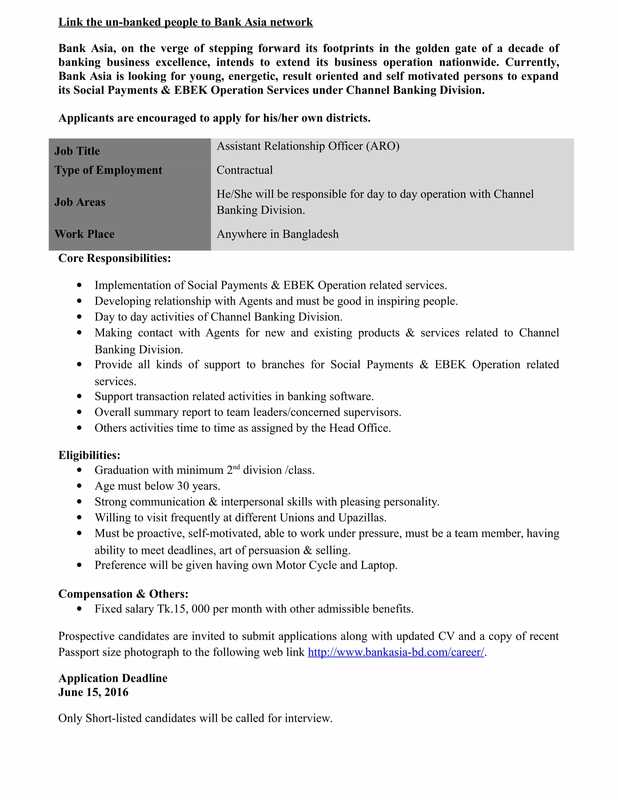 Bank Asia Job circular. Now Bank Asia Assistant Relationship Officer recruitment start on 20th February and it will be end in 5th March 2016. Eligibility and other criteria are given below. Implementation of Agent Banking, Social Payments & FBEK related services. Day to day activities of Agent Banking Division in our network. Making contact with Agents for new products & services related Agent Banking Divisions. Cash management support to Agents. Support posting related activities in Agent Banking software. Overall summary report to team leader. Post Graduation without any 3rd division of class. Must be proactive, self motivated, target oriented, able to work under pressure, must be a team member, having ability to meet deadlines, art of persuasion, art of marketing, usual knowledge of Agent Banking market. Interested and Eligible candidate can invite to submit application along with updated CV and a copy of recent passport size color photograph to the following web ling http://www.bankasia-bd.com. After that you select career tab on this website. If you are a register candidate that means If you are apply in previous job application then submit your CV by user ID and Password. If you are new user then select register now link and follow instruction. Note: Only short-listed candidates will be called for interview. Need More Information? If you need more information then go to Bank Asia official website. If you are found any trouble of this news than inform us. We can try to update right information. Thank you to visit our site. Stay with us for better post in future. Bank Asia Assistant Relationship Officer (ARO) job exam date will be announce by the authority of Bank Asia. We are also published this exam date and time, Seat plan and exam result. You can found here all kinds of information about this job. You can follow us by your Facebook, Twitter, Google Plus account. Thanks for visit our website.